JCT, a leading manufacturer of textiles and filament yarn is a vertically integrated textile company that manufactures 4.5 million meters of cotton, cotton blends and 100 percent synthetic fabric each month. 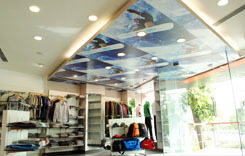 Venturing into branded ready-made garments business, through retailing, was a natural progression for the company. 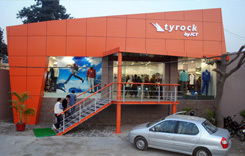 JCT launched branded apparel under the brand name “TYROCK” on December 25, 2009, with exclusive showrooms at Phagwara, Chandigarh and Ludhiana. Company’s rich heritage in cotton, synthetic & blended textiles and an extremely strong development work have given a strong fabric base for it’s brand Tyrock. JCT has setup an in house garmenting unit in it’s facility at Phagwara with a capacity to make 30,000 garments a month, to start with. Tyrock’s USP is premium products at medium level prices offered in quality outlets. 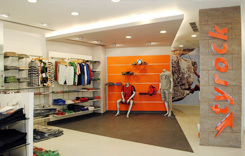 The Tyrock showrooms are targeted at tier I, II and III cities for a consumer who is in the age group of 18-40 years and likes to experiment when it comes to fashion.